LeapFrog is the leader in innovative solutions that encourage a child's curiosity and love of learning throughout their early developmental journey. 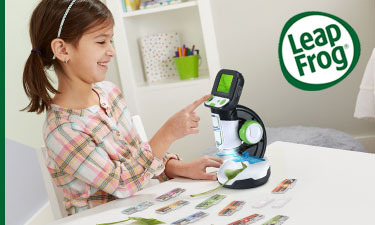 For more than 20 years, LeapFrog has helped children expand their knowledge and imagination through award-winning products that combine state-of-the-art educational expertise led by the LeapFrog Learning Team, innovative technology, and engaging play – turning playtime into quality time that helps children leap ahead. LeapFrog's proprietary learning tablets and ground-breaking developmental games, learn to read and write Systems, interactive learning toys and more are designed to create personalized experiences that encourage, excite and build confidence in children. All LeapFrog® toys are educator-approved, child-tested, follow national standards and feature British spellings, phonics and pronunciation.